NOBLESVILLE, Ind. 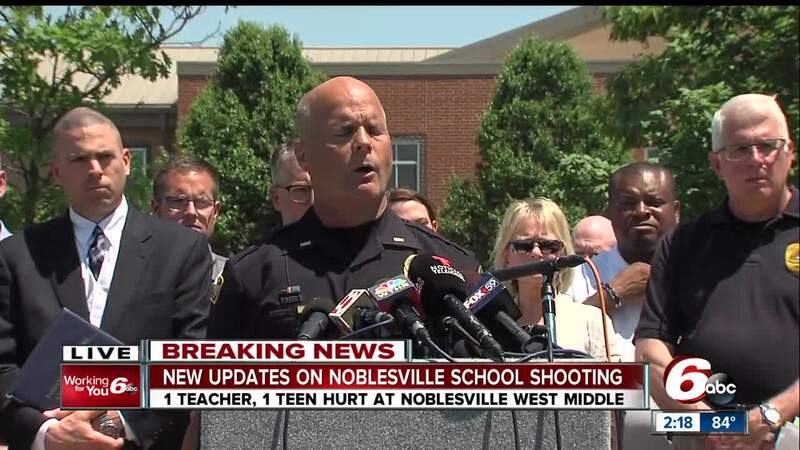 -- Parents looking for a way to talk to their children about the double shooting at a Noblesville middle school Friday would be best served instead by just listening, an expert told RTV6. Noblesville West Middle School teacher Jason Seaman and an unidentified student were shot Friday when another student opened fire in Seaman’s classroom. Seaman, who was shot three times, was able to tackle and disarm the student. Police were then able to take the suspected shooter into custody without further incident. Horrified parents told RTV6 they were shocked that a shooting could happen at a middle school – particularly one in their Noblesville community. “I am still processing my emotions about today’s terrible tragedy and I know you must all be as well. I met this afternoon with the victims and their families and want you to know that Noblesville Schools is standing by to provide them support in whatever way we can. The families expressed to me that they appreciate the outpouring of love and support they have received today. We have provided counseling support for West teachers this afternoon and have more counseling planned for this weekend. On Saturday May 26 and Monday May 28 we will offer counseling for all district teachers/staff from 10AM-2PM at NHS (gate 1) and for all district parents/students from 1PM-3PM at NHS (gate 1). Additionally, parents, staff and students can call a Hoosier crisis counseling hotline at 1-800-985-5990 or access counseling resources, including how to discuss tragedy with children, online. All events throughout the district have been cancelled for this weekend. The baseball sectional championship will be moved to another location. On Tuesday May 29 school will resume as normal at all schools except West. West will be open 10AM-2PM for counseling only and West students and families are encouraged to attend. Counselors will be on standby at all schools. I want to express my sincere thanks and appreciation to our Noblesville West administrators, staff and students who stayed calm, showed courage and followed our safety protocols. In addition, I would like to express my gratitude to the Noblesville Police Department, the Indiana State Police, the FBI, SWAT team, Hamilton County Sheriff’s Department, Noblesville Fire Department, County Emergency Preparedness and all first responders who answered the call, collaborated and responded quickly and calmly. They have helped tremendously in dealing with this terrible situation. Our elected officials, community leaders, business leaders and parents have also been lending support today and I’m so grateful for how we as a community have pulled together. Thank you for your patience today as we worked to communicate information as quickly as we could in response to changing situations. Please keep our injured school family members and their families in your thoughts and prayers." 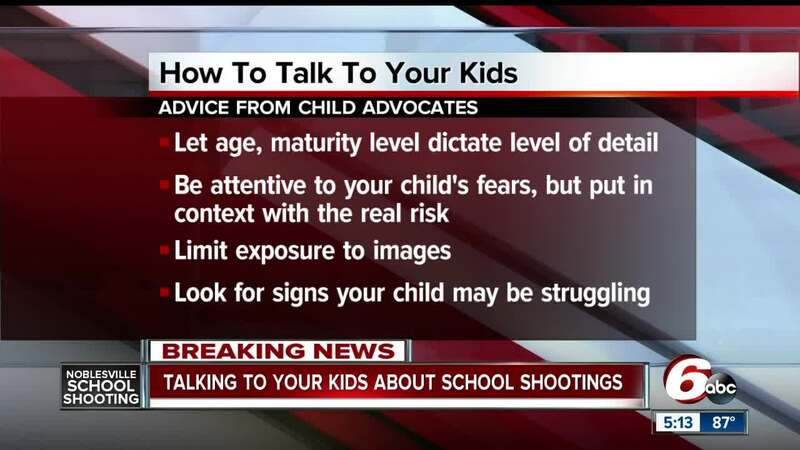 Child advocates say parents looking to talk to their children about the shooting should use their kids’ age and maturity level as a barometer for how much detail to give them. Be attentive to your child’s fears, but also put that into context with the real risk of something happening to them. Limit their exposure to news coverage. They may find images disturbing, so try to limit what they see on the news. Keep a lookout for signs this may really bother your child, such as a change in eating or sleeping or their behavior. 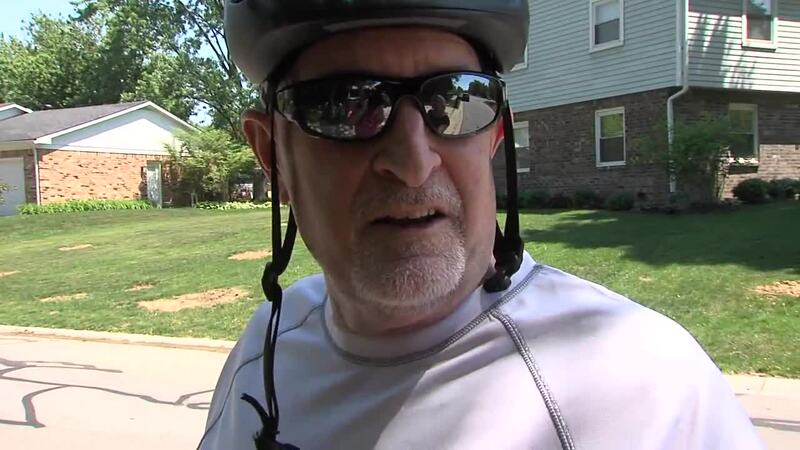 Goodpaster also said some children may not want to talk about it, and that’s OK too. What’s important, she said, is to reassure children that the adults in their lives are doing everything they can to keep them safe – whether it’s at school, at home or in their neighborhood.